Mexican Lasagna is awesome. 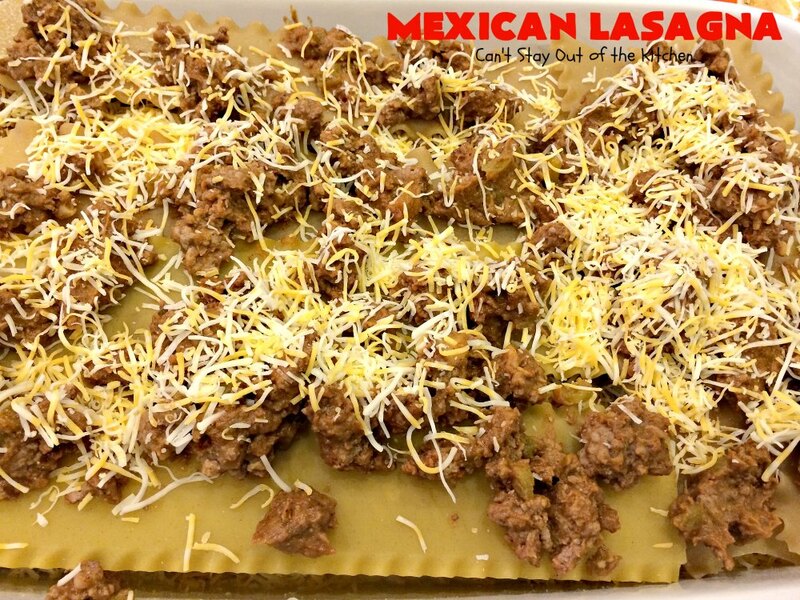 The beef mixture includes refried beans, diced green chilies and taco seasoning and is layered between noodles cheese. Then a salsa mixture is poured over top before baking. And get this, NEWS FLASH: You don’t have to pre-cook the noodles! 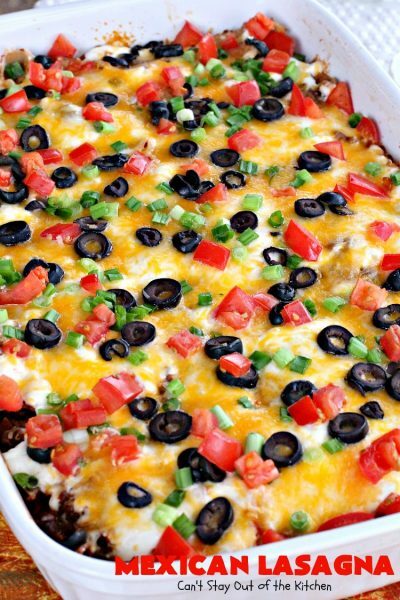 After the casserole is baked the topping is added: sour cream, cheese, green onions, olives and tomatoes, if desired. The taste is utterly amazing. While lasagnas are a little more work than some casseroles, this one is one of the best. We entertain a lot and I love trying out new recipes on people. I remember we had a houseful of company one evening when I served this and everyone raved over it. In fact, every time I’ve made this recipe it’s been for company! 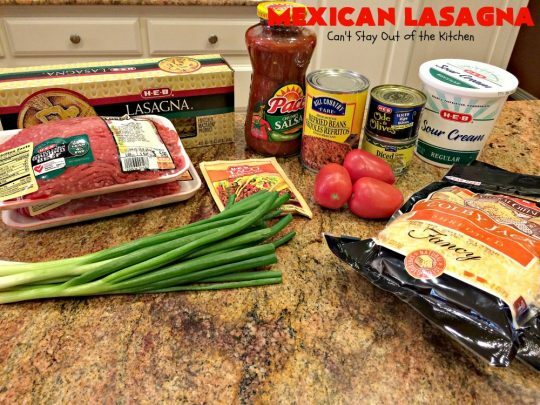 It’s a great recipe to make, especially if you enjoy different types of lasagna and appreciate a Tex-Mex version instead. Not having to pre-cook the lasagna noodles sure is an advantage and definitely saves time. I made this again yesterday, so I’m going to include updated pictures of how I did this. 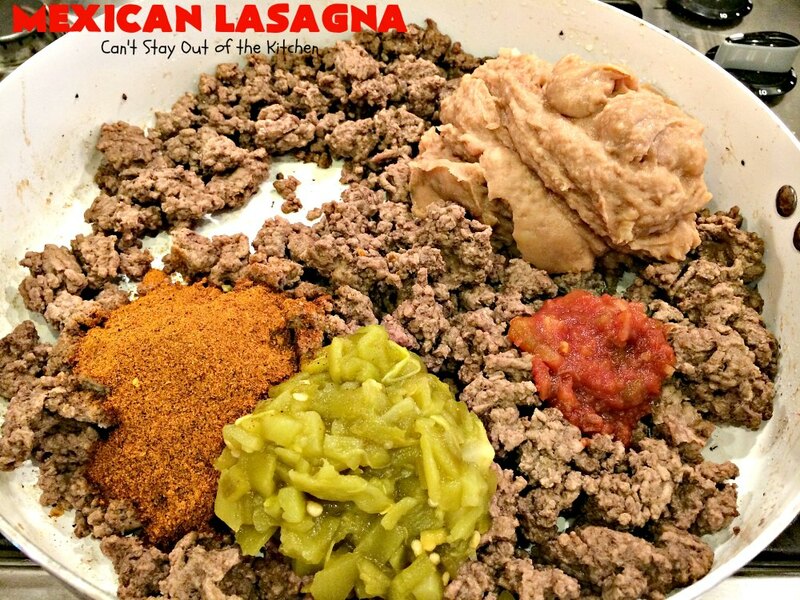 The recipe is inspired from Taste of Home’s Ground Beef cookbook. 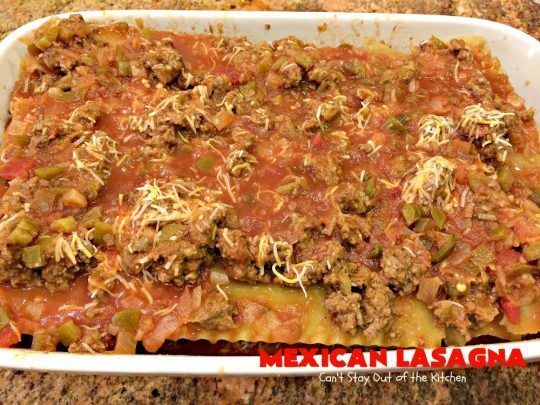 This casserole is fantastic and very worthy of being added to your lasagna or Tex-Mex collections. When I originally posted this recipe in June 2012, I was in the first couple of weeks of food blogging. I updated the pictures again in August 2012, and they were really of poor quality. I was using a cheap iPhone 3 camera at the time, and I didn’t hold the camera very steady, causing blurry pictures. On top of that, I knew next to nothing about food presentation or food photography so the lasagna didn’t show to the best advantage. I recently remade this fabulous casserole for company again (January 2015), and served it along with Butternut Squash Bake, Corn and Green Bean Casserole and Raspberry Almond Bars along with another dessert. Our guests brought salad, Guacamole and homemade salsa. We had plenty of food and they kept packing it in! 🙂 Even one of the kids said this was the best lasagna he’d ever eaten. 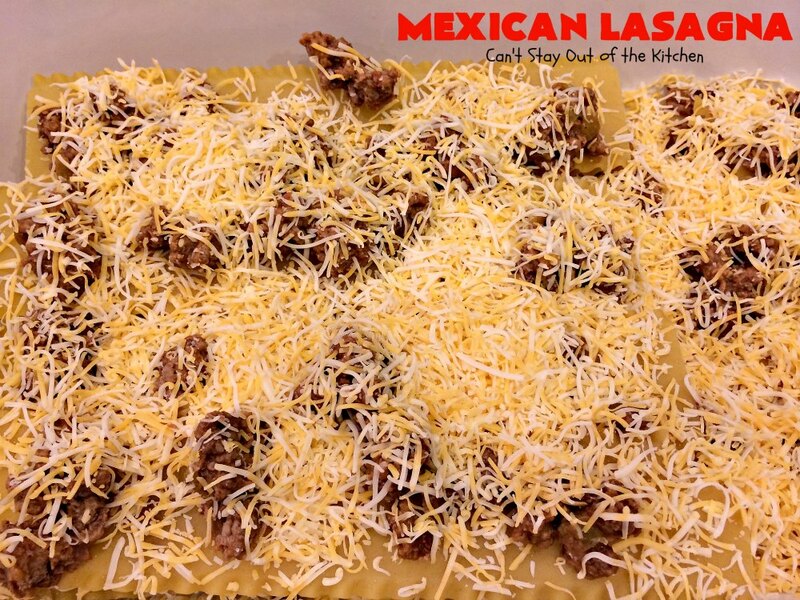 2) You can’t add extra layers and noodles to this recipe, because the salsa/water mixture that’s poured over the top is only enough juice to cook about three layers of noodles. I recommend removing the cup (or more) of beef for the bottom layer, then dividing the remaining meat into three portions for each remaining layer. (Don’t just dab the meat on like you see in my pictures). 3) Cover the casserole while baking so the noodles don’t dry out. 4) The casserole should ideally sit out for 10 minutes before cutting into it. 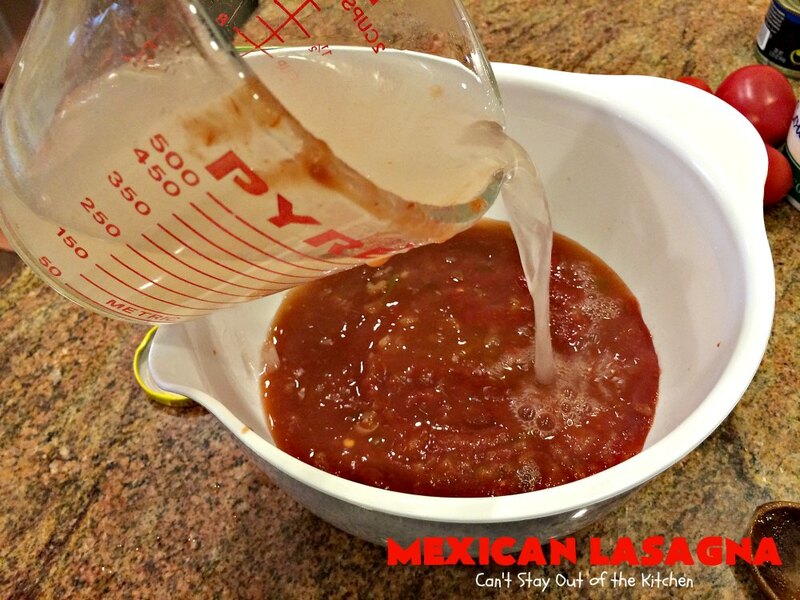 5) If you prefer, you can mix the salsa with enchilada sauce instead of water like I did for this recipe. It will provide even zestier taste. Serve with Guacamole, Hot Sauce, Pico de Gallo, sour cream and tortilla chips and you have a main dish meal to rave over. 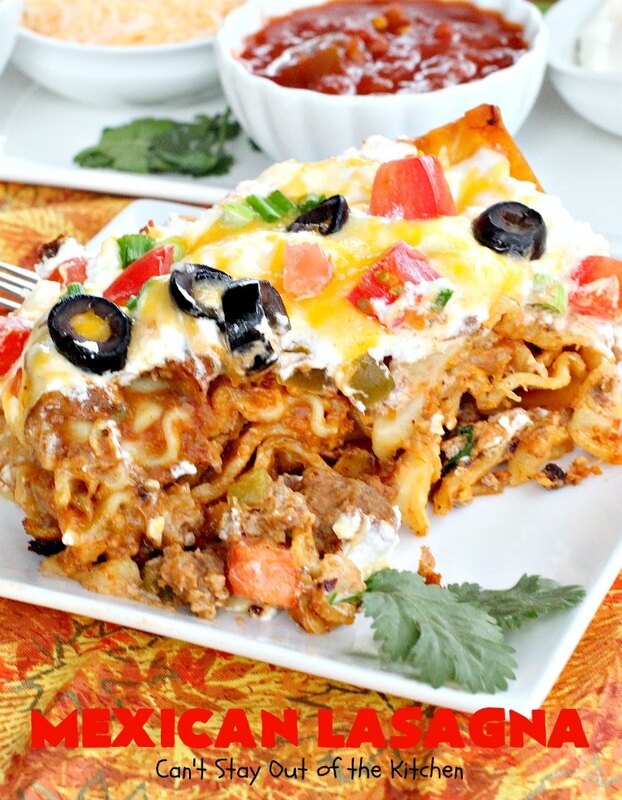 Mexican Lasagna is one of the best Tex-Mex style casseroles we’ve ever eaten. 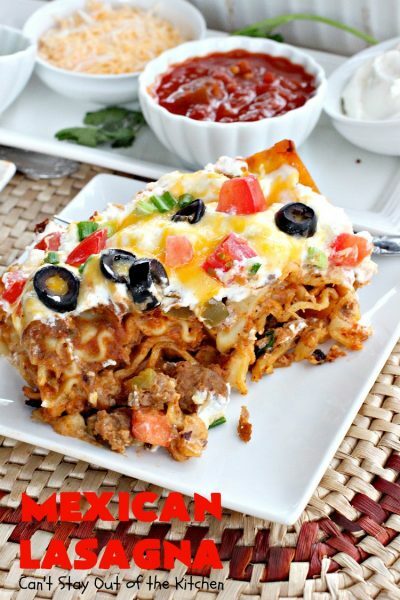 Mexican Lasagna is filled with a Tex-Mex style beef sauce, then it’s layered with sour cream, cheese, olives, tomatoes and green onions for incredibly wonderful taste. We love this hearty beef entree. The flavors just work so well together. We served Mexican Lasagna with Homemade Salsa, Guacamole, sour cream and extra cheese. Brown 2 pounds of lean ground beef or sirloin in skillet. Drain off any grease. Add diced chilies, refried beans, taco seasoning, and 2 heaping tablespoonfuls of salsa and stir together. Spray a 9×13″ glass baking dish heavily with cooking spray. Spread at least one cup of beef mixture on bottom of the baking dish to prevent the noodles from sticking. 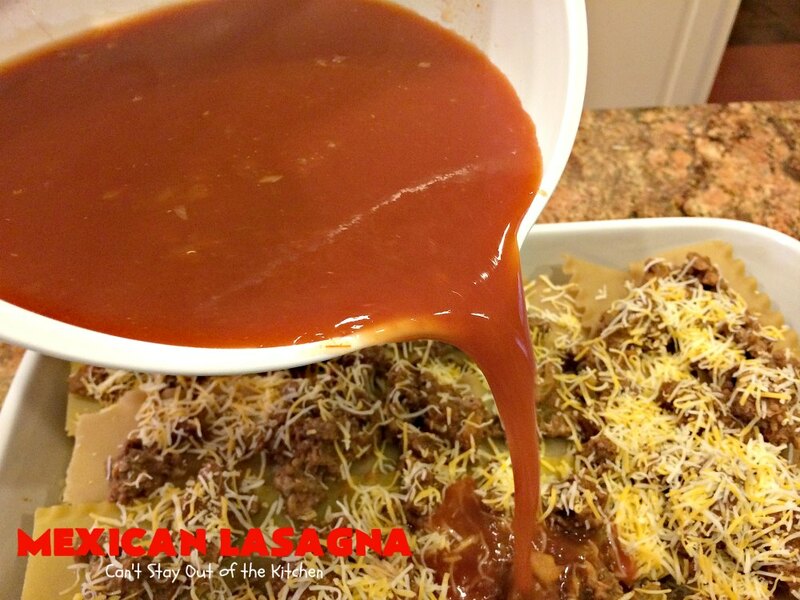 Place 4 lasagna noodles over top. Spread one-third of the meat mixture over top of the noodles. Sprinkle with 1 cup sharp cheddar cheese, Colby Jack or Monterey Jack cheese. I just dabbed the meat on this layer and ended up using tons of meat on the last couple of layers. Repeat layer of noodles, meat and cheese. Mix remaining salsa with 2 cups water (or use enchilada sauce for zestier flavor). Stir to combine. Pour salsa mixture over top of casserole. The salsa and extra water/sauce is added so the noodles will have enough moisture and juice to cook while baking the recipe but without precooking. 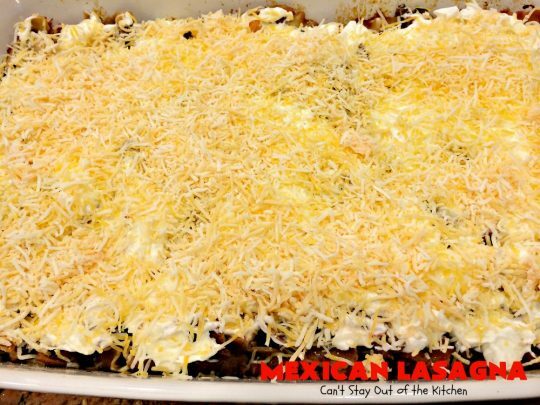 Cover casserole tightly with foil and bake in 350 oven for 1 to 1 1/2 hours. (Mine took almost 2 hours to be finished because I was cooking several casseroles at once). Once the noodles are tender, spread sour cream over top. Now add sliced ripe olives, green onions and diced tomatoes. Bake about 5 minutes or until cheese is melted. Set out about 10 minutes before cutting. Mexican Lasagna is heavenly if you enjoy a Tex-Mex twist in your food. Dig in. Oh, this is so good! 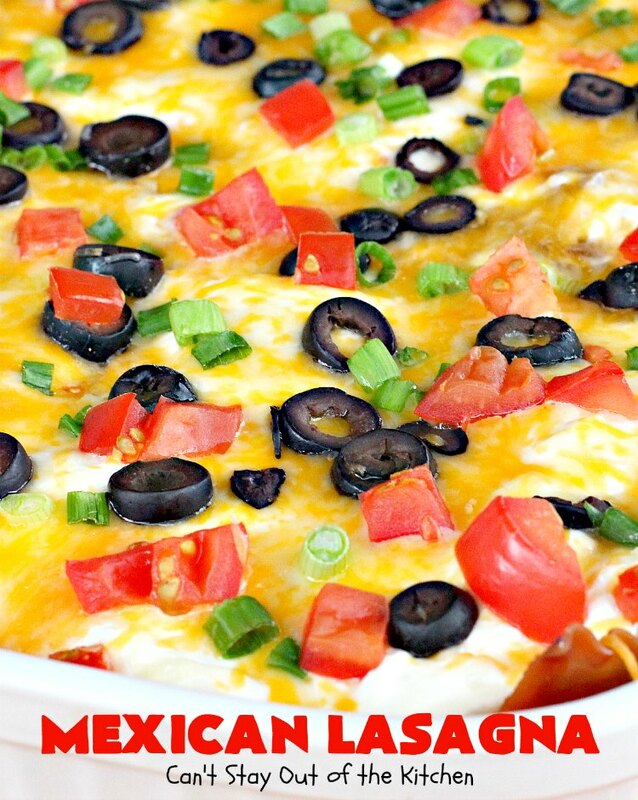 Mexican Lasagna is great served with Guacamole and Pico de Gallo. Every bite is absolutely mouthwatering. This amazing lasagna recipe with Tex-Mex flair is fantastic. 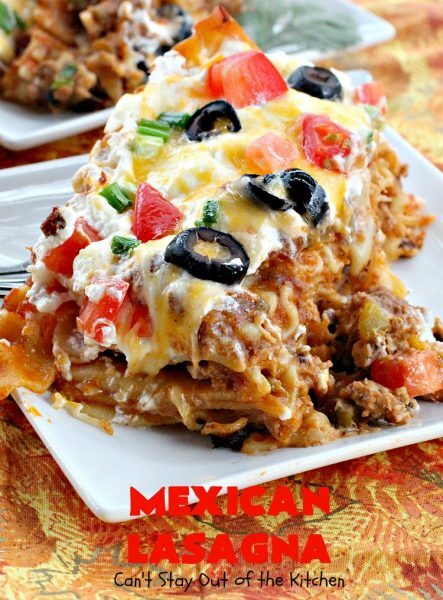 This family favorite entree has a beef mixture that includes refried beans and chilies. The recipe is layered with noodles and cheese and has a salsa layer before adding sour cream, cheese, green onions, olives and tomatoes for the topping. It's perfect for company or holiday dinners like Cinco De Mayo. Add the beans, chilies, taco seasoning and 2 heaping tablespoonfuls salsa; mix well. Heat through over medium heat about 5 minutes. 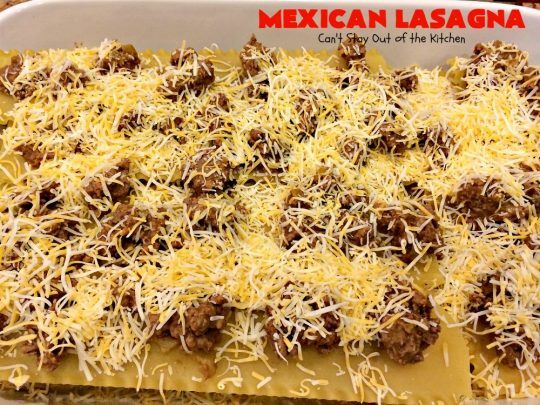 In a well greased 9x13” baking dish, spread at least a cup of the meat mixture on the bottom to prevent noodles from sticking. Layer a row of four noodles and spread with one-third of the remaining beef mixture. Sprinkle with 1 cup of cheese. Combine remaining salsa and water; pour over top. Cover and bake at 350° for 1 hour and a half, or until noodles test fork tender. Uncover; top with sour cream, then cheese, then olives, then onions, and finally tomatoes. Bake 5-15 minutes longer—until cheese melts. Let stand 10-15 minutes before cutting. NOTE: When pouring salsa/water mixture over top it is imperative that you cover the noodles as much as possible so they don’t get dried out while baking. NOTE: You must spread at least a cup of beef mixture on the bottom of the baking dish or the noodles will stick to the bottom of the pan. NOTE: You can use enchilada sauce with the salsa to pour over top, if desired. NOTE: Since the noodles aren't pre-cooked you cannot add additional layers or there is not enough moisture in the casserole to bake them through sufficiently. NOTE: Baking time is approximate. Your oven may take 1 hour or 2 hours depending on if it runs fast or slow. Check for doneness by pricking noodles with a fork. If the noodles are tender, the casserole is cooked enough. NOTE: If you wish to precook your lasagna noodles, cook only to al dente. Then spread the salsa over top of the casserole WITHOUT mixing it with water. Bake about 30-40 minutes or until casserole is bubbly. Then spread with sour cream, add cheese, green onions, olives and tomatoes. Bake an additional 5-10 minutes or until cheese melts. NOTE:homemade taco seasoningrecipe If you prefer to make your own , this is a great that can be made up in 5 minutes. Recipe inspired from Taste of Home. 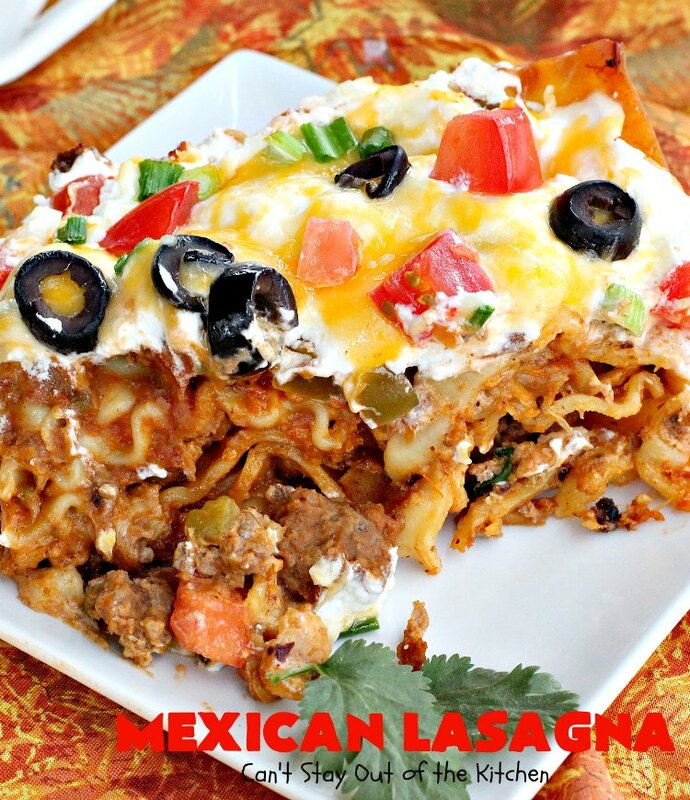 This amazing lasagna recipe with Tex-Mex flair is fantastic. 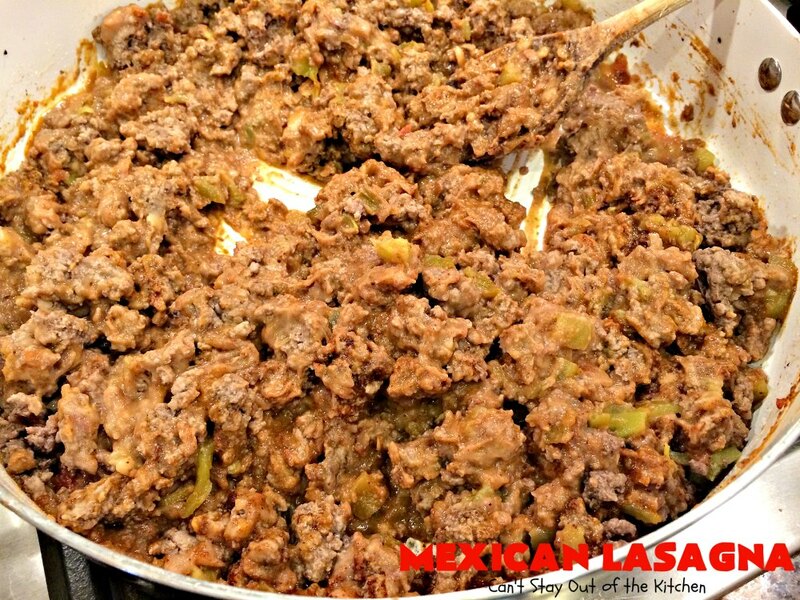 The beef mixture includes refried beans and chilies. The recipe is layered with noodles and cheese and has a salsa layer before adding sour cream, cheese, green onions, olives and tomatoes for the topping. In a well greased 9×13” baking dish, spread at least a cup of the meat mixture on the bottom to prevent noodles from sticking. When pouring salsa/water mixture over top it is imperative that you cover the noodles as much as possible so they don’t get dried out while baking. [br][br]You must spread at least a cup of beef mixture on the bottom of the baking dish or the noodles will stick to the bottom of the pan. [br][br]You can use enchilada sauce with the salsa to pour over top, if desired. [br][br]Since the noodles aren’t pre-cooked you cannot add additional layers or there is not enough moisture in the casserole to bake them through sufficiently. [br][br]Baking time is approximate. Your oven may take 1 hour or 2 hours depending on if it runs fast or slow. Check for doneness by pricking noodles with a fork. If the noodles are tender, the casserole is cooked enough. [br][br]If you wish to precook your lasagna noodles, cook only to al dente. 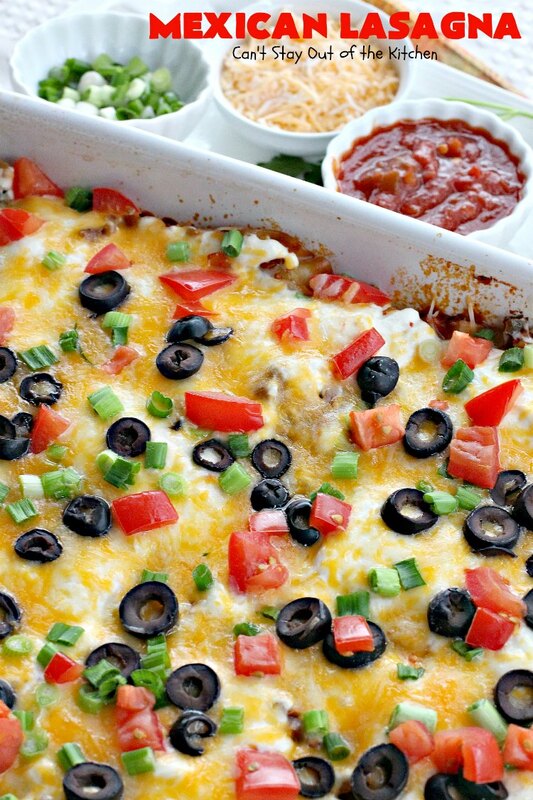 Then spread the salsa over top of the casserole [u]WITHOUT[/u] mixing it with water. Bake about 30-40 minutes or until casserole is bubbly. Then spread with sour cream, add cheese, green onions, olives and tomatoes. Bake an additional 5-10 minutes or until cheese melts. Every bite of Mexican Lasagna is amazing. 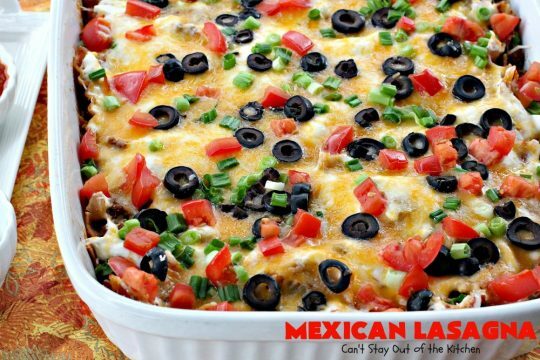 I love the flavors of salsa, Pico de Gallo, Taco Seasoning and refried beans which give this casserole a superb flavor. 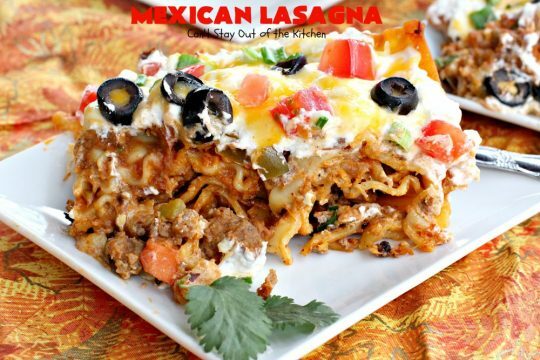 Mexican Lasagna is a great company casserole. Our guests sure loved it. Katie, I’m ecstatic that you and your family loved the recipe! Yes, it is hard sometimes having to stop and take pictures in the middle of the process or taking pictures before my family actually gets to sit down to eat the final product. But it is worth it in the end. I’m so glad you enjoy this recipe. 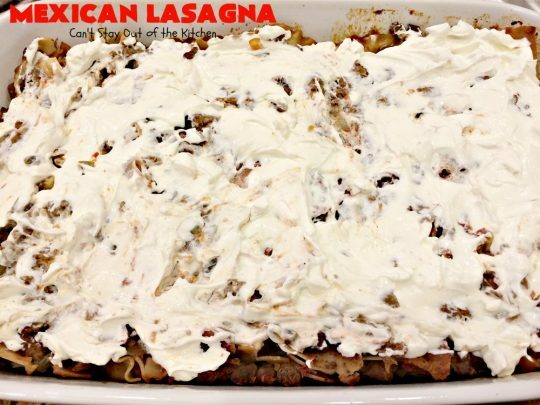 If you enjoy lasagna, have you tried My Favorite Lasagna? I also have a really good Pesto Lasagna, a Taco Lasagna and a Ravioli Lasagna. Some are easier recipes than others, but all delicious. Thanks again for letting me know how much you enjoyed the recipe. Have a great week. Thank You so much for this recipe all my guess raved about it. I used 4 lb.of hamburger and some other things. Was wonderful. Will be making it often. So glad it turned out so well for you. This has always been one of our favorites. It’s a good bit of work but worth it. Sounds delicious. Hope everything worked out well for you. Hi, sorry to bother you, but will this serve 8 people ? Making a salad with it. Hi, Celene. It will serve at least 8 people. Probably more like 12. Enjoy. Hi, Celene. I would prepare it the day before hand but not bake it. When you get ready to bake it the next day, make sure there’s still enough moisture on top of the noodles from the salsa/sauce mixture on top. If it has absorbed into the noodles, you may want to add a little more before baking. I hope it works out well for you. This Looks yummy! 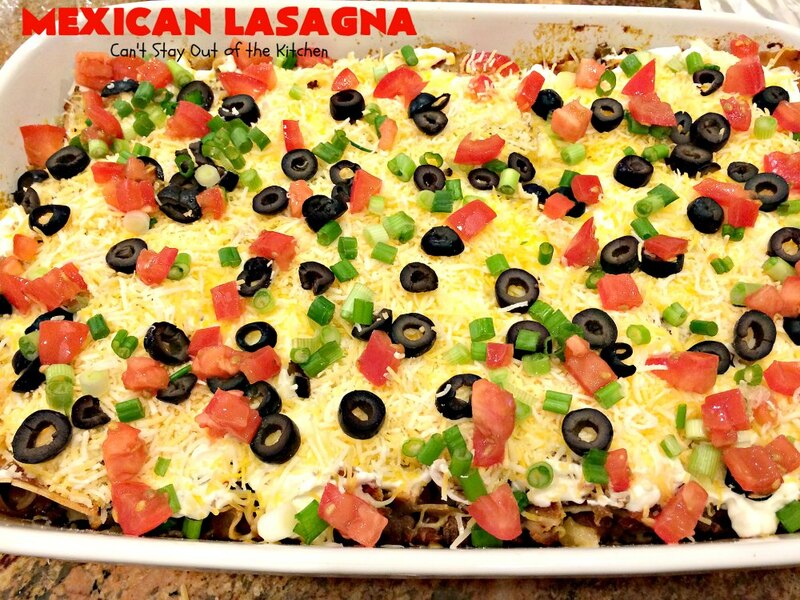 I am making it now for my family…and a second one for tomorrow’s company Cinco de Mayo pot luck. Hi, Haley. I think you can refrigerate it for several days and reheat the leftovers. (you may have to scrape off some of the toppings before microwaving and add them later). Can I prepare this in the morning and bake in the evening? Hi, Ashley. Yes, I’ve done that before. After we put the toppings on and before we put the lasagna back in the oven do we put the top ( foil )back on first ? Hi, Linda. I do not put foil back on the casserole after I add the cheese and toppings. I bake it only for about 5 minutes – just enough to allow the veggies to get a little tender instead of raw, and the cheese to melt. Thanks for sharing, my hubby loved It! My picky son even ate a plate full. Yumy! 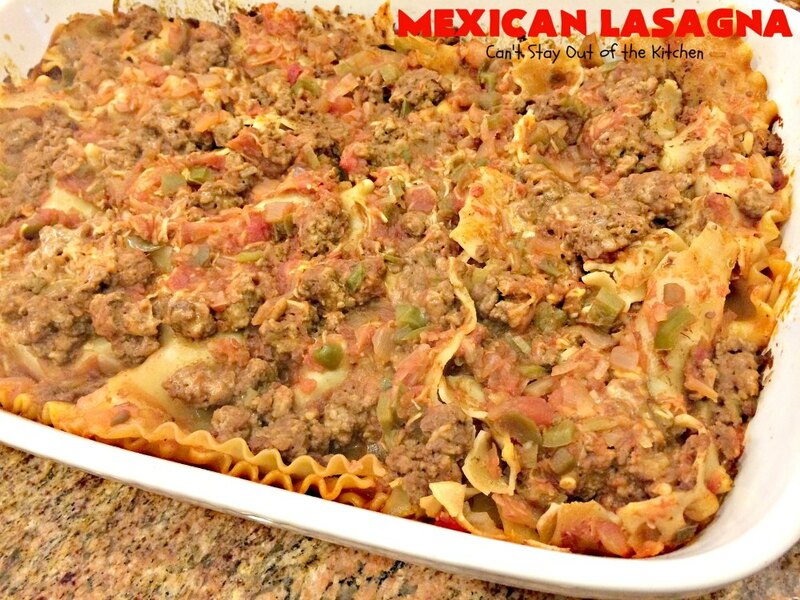 Hi Cherise, so glad you and your family loved the lasagna. We’ve always enjoyed this recipe and because it makes so much it’s great to share with company. I cannot wait to make this! I am wanting to make and freeze for when our baby arrives. Would you add the sour cream an cheese before freezing? Or wait until the lasagna has thawed and been reheated to add? 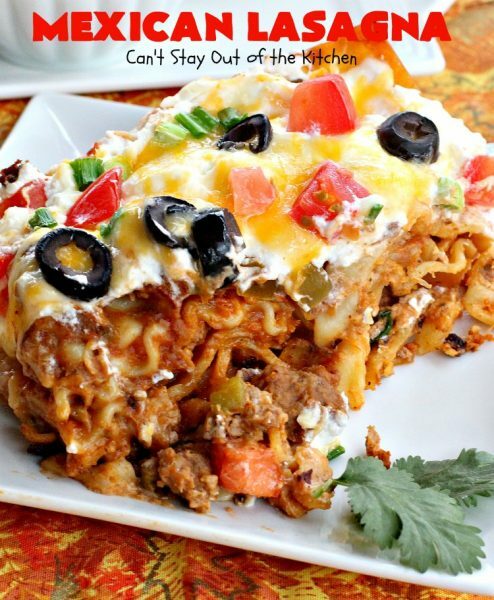 Hey, Samantha, I would probably freeze this without the sour cream, cheese, tomatoes, etc. for the final topping. I would add them after baking, just like if you were making the recipe fresh. (You could add the sour cream and cheese and freeze it, but not tomatoes or any other topping, so it’s probably easier to wait and do it later). Hi, Valerie. Thanks so much for stopping by. This really is a delicious lasagna recipe and I loved your recipe, too. I will have to get around to making it sometime soon. The hardest thing about taking pictures is the lighting. I live in Texas where, thankfully, we have sun about 300 days per year. I prefer taking pictures outside rather than inside, no matter what the conditions. I’ve taken pictures when my chocolate chips (props) melted in 5 minutes and when it was so cold I had to wear full winter regalia including gloves. 🙂 If you have a good camera, the next thing you may want to consider is using PicMonkey. It’s a free online program where you can lighten, resize, sharpen and add color to your pictures along with a watermark. It’s wonderful and the royal membership is only about $35/year. Believe me, it can fix a lot of poor quality pictures. 🙂 I guarantee if you keep working hard you will see great progress in your picture taking abilities year after year. Thanks again, Valerie. I appreciate your comments. This is the BEST and easiest lasagna EVER!!!!!!!! My Family LOVED it!!!!! Bravo! Thank you so much, Kristin! I’m not sure it’s actually the easiest 🙂 but it sure tastes fabulous. So happy that your family loved it. Perhaps you can see why it’s our go-to lasagna recipe. Cooking for 9 every night has it’s challenges. I made this last night, crossed my fingers and got 8 thumbs up! Only little Demi (2 yrs. old) didn’t eat it but she doesn’t eat anything ever. Will definitely make this again. Easy to follow directions and good pics made it easy to make. Thanks. So glad you enjoyed it Linda. 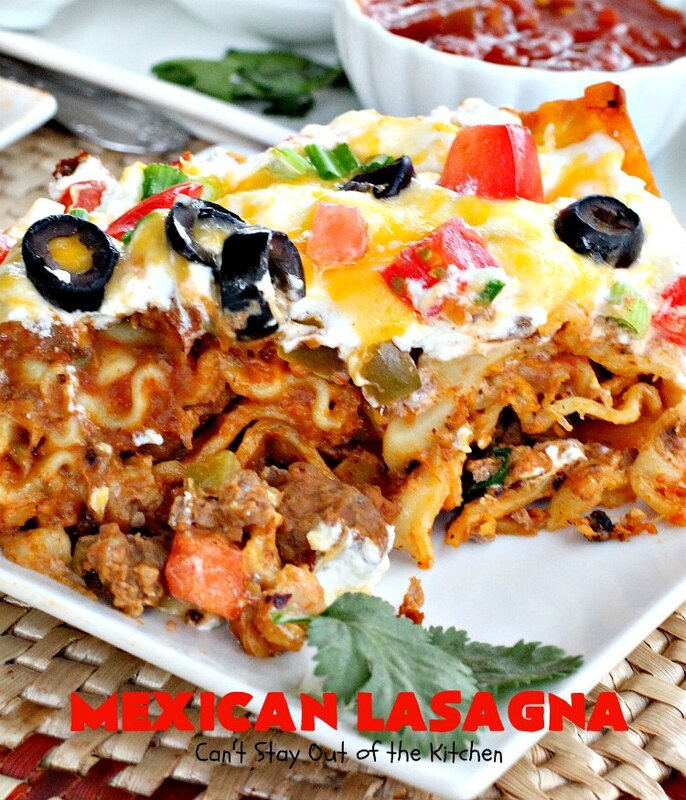 This is one of our favorite lasagna recipes, and I sure like the Mexican twist to it. Thanks for stopping by. Hi Teresa. Thank you so much for this recipe. It’s delicious! I loved the flavor and textures. And it looks so pretty with the black olives, green onions, and bright red tomatoes on top. I reheated a piece today for lunch, and it’s even better the second day. I did follow your suggestion to use two cups of enchilada sauce instead of water. I really appreciate your clear, step by step directions and pictures. It gives a beginner cook like me a lot more confidence! What if I use the no boil noodles? Still only 30-40 minutes? Yes, Lindsay, you will definitely want to cut the time down and you may not want to add all the extra water to the sauce on top because the whole purpose of that is to soak into the noodles so they cook. You can freeze it after you bake it, but I would not freeze it before you bake it unless you pre-cook the noodles. This looks amazing, I will HAVE to try it! 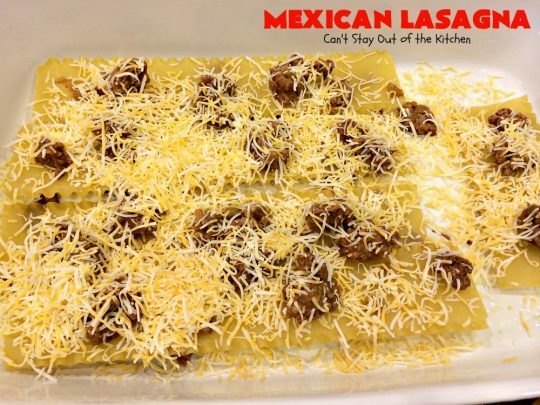 Just one question: if I decide to pre-cook the lasagna noodles, how would that alter the cook time? Otherwise, I think the only other change would be to omit the additional water in the salsa for the topping. Thanks!! It is fantastic. Everyone loves this main dish.